President Donald Trump reacted Wednesday to the news that multiple explosive devices were mailed to prominent Democrats across the country as well as CNN studios in New York City. 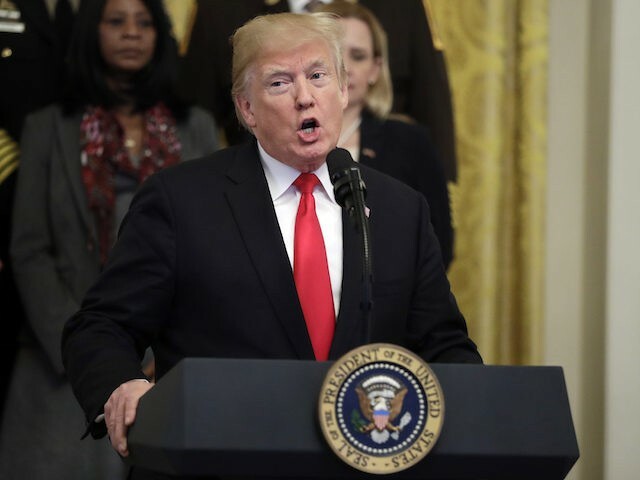 The president commented on the attempted bombings during a bill signing event highlighting the administration’s efforts to curtail the opioid epidemic in the United States. Trump’s statement earned hearty applause from lawmakers from both parties present at the White House for the ceremony. He vowed a full government response to the attacks and vowed to bring those responsible to justice. First Lady Melania Trump first took the podium at the White House event to condemn the attacks. “We cannot tolerate these cowardly attacks and I strongly condemn those that choose violence,” Melania Trump said. The first lady then highlighted the administration’s efforts to assist those suffering from opioid addiction and infants born with neo-natal addiction. The day’s events began with devices sent to former President Barack Obama and former First Lady Hillary Clinton intercepted by Secret Service. A device addressed to former CIA director John Brennan was sent to a CNN studio in New York City and a device sent to Rep. Maxine Waters was intercepted at the U.S. Capitol. Other reports detailed suspicious packages targeting Sen. Kamala Harris and former Attorney General Eric Holder and Debbie Wasserman Schultz.